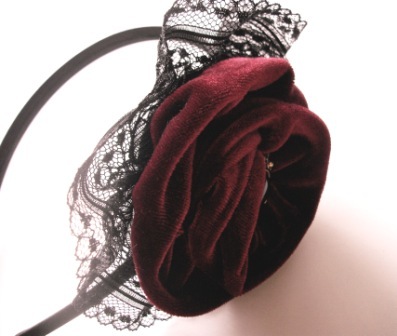 On Sunday, May 27, 2012 from 12-3pm, we will be making gorgeous vintage inspired headbands at Think Outside the Store! This workshop is for all skill levels, ages 14+. Add as little or as much as you like to craft your unique, ready-to-wear headband. This is the first workshop where I'll be teaching the "twisted rosette" technique, which is easy to learn and very popular. Space is limited, so please RSVP by clicking the light bulb on the sidebar. See you there! 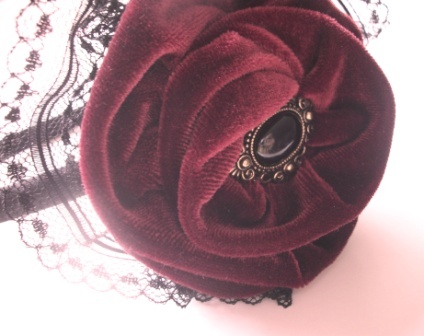 Velvet ribbon rose with cabochon center and lace trim.